Critical Section - Rocky the Squirrel rides again! 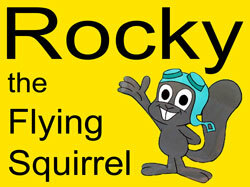 Rocky the Squirrel rides again! Hey guess what? I'm riding the Furnace Creek 508 again! Rocky the Squirrel rides again! You may remember, two years ago I did this, a 508 mile cycling race through Death Valley, and while I gave it my best shot there was no joy in Badwater as I dropped out after 300 miles. I have applied to race again this year, and have been accepted (! ), and this year I am going to finish. I'll be physically ready but more importantly mentally ready... having done it one before will help immeasureably; I know [sort of] what I'm up against. The hardest part is Sunday morning, from Furnace Creek to Baker, that's when everyone drops out (historically about half of the people who start as solo racers actually finish). After I make it to Baker, well, it isn't easy from that point, but I'll manage to finish.